Finally, we must tie all of the control components together into a cohesive system. We begin with a block diagram for a single-axis control system (See Fig. 11-3). As we refine the design, we add or modify feedback loops for rate and altitude data, define gains and constants, and fine tune the equations of motion. To do so, we need good mathematical simulations of the entire system, including internal and external disturbances. Usually, linear differential equations with constant coefficients describe the dynamics of a control system, thus allowing us to analyze its performance with the highly developed tools of linear servomechanism theory. With these same tools, we can easily do linear compensation to satisfy specifications for performance. Fig. 11-3. Diagram of a Typical Attitude Control System with Control Along a Single Axis. Control algorithms are usually Implemented In an onboard processor and analyzed with detailed simulations. We typically apply linear theory only to preliminary analysis and design. As the design matures, nonlinear effects come strongly into play. These effects may be inherent or intentionally introduced to improve the system's performance. Feedback control systems are of two kinds, based on the flow of their control signals. They are continuous-data systems when their control signals flow continuously without interruption; they are sampled-data systems when sampling occurs at equal intervals. Most modem spacecraft process data through digital computers and therefore use control systems that sample data. Although it is beyond the scope of this handbook to provide detailed design guidance on feedback control systems, the system designer should recognize the interacting effects of attitude control system loop gain, capability of the attitude control system to compensate for disturbances, accuracy of attitude control, and control system bandwidth. Three-axis stabilization. 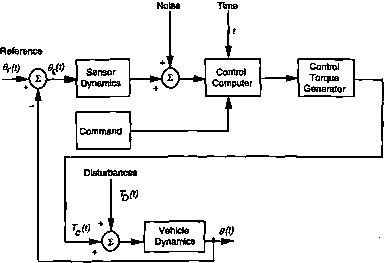 Different types of active control systems have different key parameters and algorithms. Frequently, 3-axis control can be decoupled into three independent axes. The most basic design parameter in each axis is its position gain, K .* This is the amount of control torque which results from a unit attitude error and can be expressed in N-m/deg or N-m/rad. The position gain is selected by the designer and must be high enough to provide the required attitude control accuracy in the presence of disturbances, or K„ > TDlde where Kp is position gain, TD is peak disturbance torque, and 6e is allowable attitude error. The value of the position gain also determines the attitude control system bandwidth and speed-of-response. The bandwidth is given by con -- (Kp ¡I)112, where / is the spacecraft moment of inertia. The bandwidth defines the frequency at which control authority begins to diminish. Attitude control and disturbance rejection are effective from 0 frequency (d.c.) up to the bandwidth. Speed of response is approximately the reciprocal of bandwidth. Note that position gain is inversely proportional to allowable error and bandwidth is proportional to the square root of position gain. Therefore, high accuracy implies high position gain and high bandwidth. However, high bandwidth may cause tending resonances to affect control system performance. With the relations given, the system designer can estimate required position gain from his estimates of disturbance torque and accuracy requirements. He can use this estimate to compute control system bandwidth. This allows him to specify minimum bending frequencies as discussed below. In defining algorithms for the control system, we must also consider whether the vehicle will have flexible-body effects that can make the vehicle unstable. Spacecraft with flexible appendages such as antennas, booms, and solar panels may produce slight warping at their natural frequencies. Control torques and external-disturbance torques will cause structural vibrations, in some cases close to or within the control system's bandwidth. The lowest natural frequencies of flexible components should be at least an order of magnitude greater than the rigid-body frequencies before we can neglect flexibility. For further discussion of how structural flexibility affects the control subsystem, see Sec. 3.12 of Agrawal . where Is is the spin axis inertia, lj is the transverse axis inertia, and cos is the spin frequency. * In its simplest form, a spacecraft attitude control system can be represented in s-domain as a l/Is2 plant and may be controlled by a proportional plus derivative (PD) controller where Tc s Kp8e+ Kr ée . The position gain, Kp, controls system bandwidth and the rate gain, controls damping. where h is the angular momentum of the spinning body. Thus, spacecraft with large inertias and small wheels have small nutation frequencies (i.e., long periods). where h is the system angular momentum. A lower limit on control bandwidth is usually provided by the orbit rate <0o, which for a circular orbit is where p = 3.986 x 1014 m3/s2 and r is the orbit radius. Attitude determination. A full discussion of determination algorithms requires a dedicated reference such as Wertz . We will highlight only some of the basic concepts. The basic algorithms for determination depend on the coordinate frames of interest (e.g., the sensor frames, local vertical frame, or Earth-centered inertial frame), and the geometry of the measurements, parameterized by Euler angles (such as roll, pitch, and yaw) or quaternions (which are scaled vectors for Eigen-axis rotations of coordinate frames). Inertial platforms and star sensor data usually are suited to inertial quaternions, while Earth-pointing spacecraft often use a local-vertical, aircraft-like set of Euler angles. Simple spacecraft may use the sensor readings directly for control, while more complex vehicles or those with higher accuracy requirements employ some form of averaging, smoothing, or Kalman filtering of the data. The exact algorithms depend on the vehicle properties, orbit, and sensor types used. FireSat algorithms. For our momentum-bias FrreSat example, control separates into pitch-axis control using torque commands to the momentum wheel, and roll-yaw control using current commands to the electromagnets. The pitch-wheel desaturation commands must also be fed (at a slow rate) to the magnets. The pitch-wheel control is straightforward, using proportional-plus derivative and, optionally, integral control. 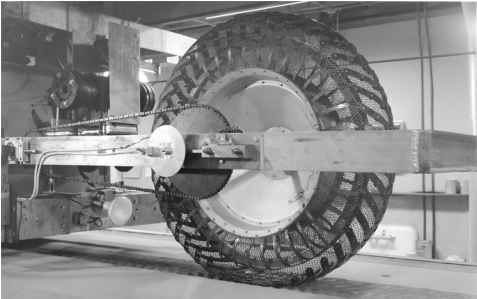 The roll-yaw control design starts by using the linearized nutation dynamics of the system, and is complicated by the directional limitations of electromagnetic torque (the achievable torque is perpendicular to the instantaneous Earth magnetic field). The nadir-oriented control system may use an Earth-referenced, aircraft-like Euler angle (roll, pitch, yaw) set, although quaternions should also be considered for their lack of singularities during off-nominal pointing. The horizon sensors directly read two of the angles of interest, pitch and roll. Yaw needs to be measured directly from Sun position (during orbit day) or from the magnetometer readings (using a stored model of the Earth's field), or inferred from the roll-yaw coupling described earlier. The magnetic field and Sun information require an uplinked set of orbit parameters, and increase the computational requirements of the subsystem. Overall, meeting the 0.1 deg yaw requirement when the Sun is not visible will be the toughest challenge facing the ADCS designer, and a form of coasting through the blackouts, without direct roll-yaw control, may be most appropriate.